Summer’s here! For many, this is reason to rejoice. Summer can mean time off from school or work, beach-going or sipping cocktails by the pool. But for runners, the thought of sun and heat can evoke dread. The rising temperatures instead mean risk of overheating, dehydration, cramping and bonking. A smart runner will take extra precautions to deal with these threats, such as rising early to beat the heat, upping their fluid consumption and wearing appropriate clothing designed to keep cool. Note the term designed, rather than proven. Is that high-tech t-shirt with “moisture-wicking” technology that works like a “built-in air conditioner” (yes, this a real product claim) really worth it, or is it yet another gimmick intended to drain your wallet? Just in time for the soaring mercury we’ve been experiencing, scientists put such claims to the test. A recent study tested the efficacy of four different t-shirts at keeping runners cool, dry and running strong. They recruited eight well-trained men to participate in weekly test sessions, although the authors do not describe what characteristics, such as mileage or years running, constitute “well-trained”. At each session, the runners were randomly assigned to wear one of four t-shirts: a plain old cotton Fruit of the Loom, or three fancy polyester tees with different channels (4, 6 or 8) designed to increase air ventilation. The researchers then cranked up the heat to 32°C (90°F), in which the runners ran at a moderate level (70% peak oxygen uptake) for 30 minutes followed by a ramp-to-exhaustion test. So did their study back claims that coolmax fabric actually keeps runners cool? The runners’ body temperatures were in fact lower in the polyester shirts than in cotton, but only during the recovery period. There were no temperature differences while the participants were actually running. However, during both running and recovery, humidity – measured at both the chest and back – was reduced when runners wore polyester shirts. Runners reported feeling fewer sweating and shivering sensations in the polyester tees, but again, only during recovery. Notably, there were no differences between the t-shirt conditions in terms of time to exhaustion, heart rate, oxygen uptake, respiration, blood lactate, ventilation or subjective sensations of exhaustion, heat or wetness. Hence, the benefits of polyester over simple cotton appear to be essentially limited to more effective cooling and drying during recovery. Critically, the high-tech shirts did not influence any measure of performance or affect cardiorespiratory or metabolic function. 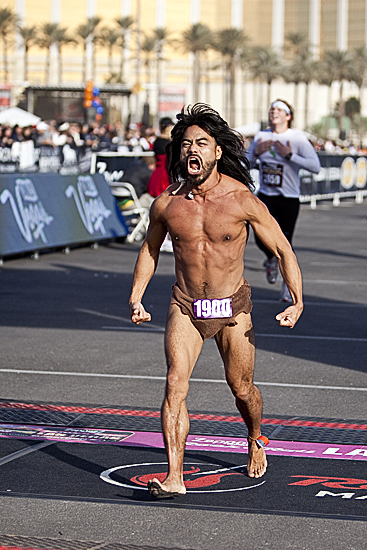 What about the first time runner, Scott Jurek or that Barefoot Caveman? However, as with any negative finding, we cannot definitively conclude that fabric does not actually influence running performance. It’s altogether possible that additional differences might be detectable in larger or alternatively designed studies. As prior training adaptions most certainly affect a runner’s cooling capacity, it seems critical to not only thoroughly describe the participants’ training histories (which were omitted here), but also to test a more diverse runner population. For instance, are less adapted beginner runners, or those who habitually train in cool climates, more adversely affected by poorly ventilating clothing than elite runners, or those who often train the heat? Similarly, it would be interesting to see how different fabrics hold up under different training protocols. The authors addressed this issue in part, by testing both submaximal and high-intensity running periods. But additional studies are needed to determine to what extent the cooling and ventilation properties depend on running duration. Such studies will be most relevant to extreme endurance runners, for whom even the slightest advantage in staying cool or dry can make a huge difference in the last stretch of a 100-miler. 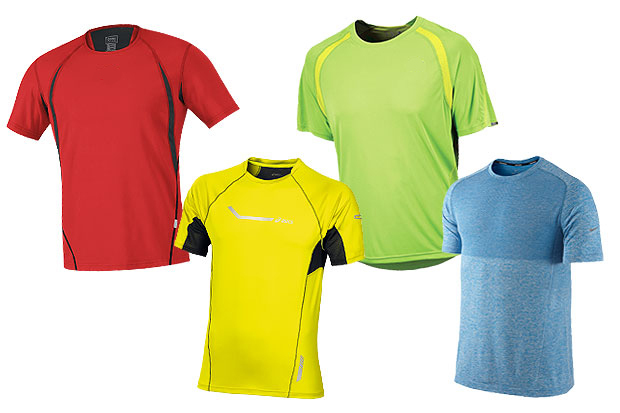 Finally, cotton and polyester are certainly not the only available running fabrics. In fact, during extreme heat many runners prefer to don little more than their own skin, which just might be the most efficient cooling system. Bare skin might therefore be a more logical experimental control than cotton. Might all fabrics have adverse effects when compared to shirtless, or are cotton and polyester really just as effective as nature’s own coolmax? If you’re looking to save some dough, this study offers some justification for sticking with your good old cotton tee. You might stay hotter and wetter post-workout, but you’ll probably be able to run just as far and hard as in that $50 tech shirt. But these findings are by no means exhaustive or conclusive. So if for you, cotton and heat are a reliable recipe for bonking, wear whatever feels and performs best. So how do you beat the heat? Are you a coolmax devotee? Is Fruit of the Loom as techie as you get? Or maybe you redefine minimalist running and run as bare as law permits? Tags: coolmax, heat, running, running clothing, running performance, running shirt, running weather. Bookmark the permalink.